← Now here is a lady. This book has been composed from the inside out. The idea engenders the characters, the characters produce the drama, and this is, in effect, the law of art. … Destiny and in particular life, time and in particular this century, man and in particular the people, God and in particular the world, this is what I have tried to include in this book; it is a sort of essay on the infinite. We can look at Cézanne’s still lifes in roughly the same way: “Fruits and in particular the apple, kitchens and in particular this kitchen, rooms and in particular this room, God and in particular the world, this is what I have tried to include in this painting; it is a sort of painting of the infinite.” Hugo created his essay on the infinite with words that build into stories. Cézanne was trying to do the same thing with paint that builds into visual scenes. 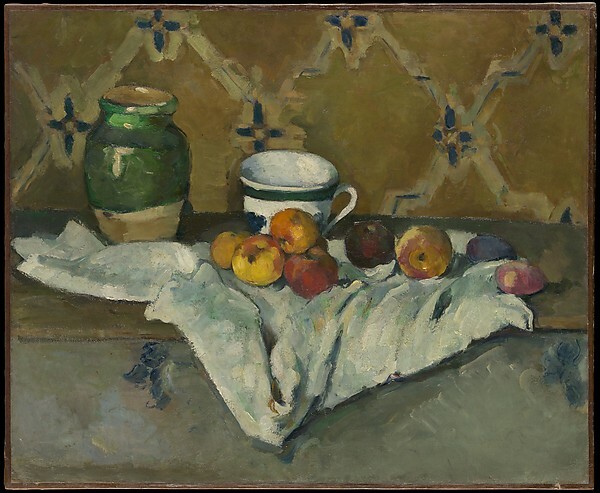 By messing with perspective and tonal values, Cézanne created the feeling in his paintings that all the individual objects in the scene are connected and interpenetrated. Here’s a beef: why does it take five clicks to find out who “the hanged man” is in The House Of The Hanged Man at Auvers? Well, turns out I was wrong. Supposedly, the house had been owned by a Breton man named Penn’Du, which sounds like the French word for hanged man – ‘Pendu’. Hmmmmm. 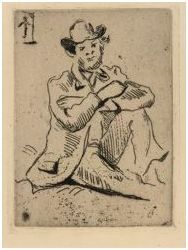 Cezanne also did a print in 1873 (same year) entitled “Guillaumin with the Hanged Man”. In this image he actually has a little man hanging in the corner. I read that the tiny hanging man was the sign of an inn called ‘Le Pendu’. Well there sure are a lot of coincidences here!